In late November, www.ConcoursDates.com will become concours.news — a new identity and format full of info about the Concours d’Elegance car shows. The site will be known simply as “concours dot news” — there’s no need to use a “.com” extension. 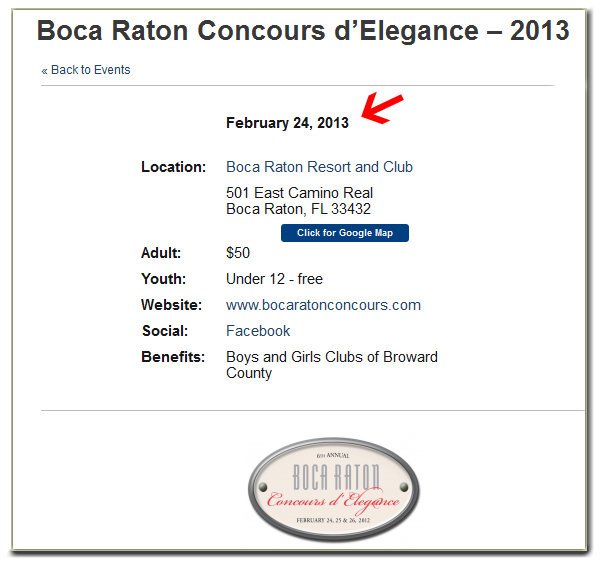 Links to events and search results to pages on this site will be redirected. Subscribe HERE to receive notifications by email. 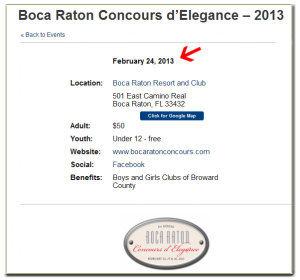 Visit often as we continue to add shows and blog about interesting concours topics. Help us grow by posting your suggestion to our Facebook page or by sending us an email. See when shows are/were by going to the red menu tabs above and selecting Upcoming Events, Full Calendar or Past Events. Also in the sidebar to the right are an interactive calendar, a link to events by regions of the United States and a search box. Our goal is to make ConcoursDates.com the first place you visit for concours schedules and information on the collector car hobby. Traditionally, the formal car show year begins in Florida in February with the Boca Raton Concours d’Elegance, followed by the spectacular Amelia Island Concours, which features several days of tours, auctions, art shows, and seminars prior to Sunday’s car display on the golf course. Following a flurry of shows in the summer and fall throughout the US and Canada, the season ends in November with Hilton Head in South Carolina. How much are spectator tickets? $10 to $40, usually. The primary mission of every concours d’elegance is to raise funds for a charity or cause. Ticket price to enter the show field often includes a program or poster, free parking and shuttle service. The notable price exception is the Pebble Beach Concours, which has general admission fees of $275 in advance and $300 on the day of show. Which charities benefit from the concours? Healthcare, medical research, education, community service, and more. The primary mission of virtually every concours d’elegance is to raise money for charitable and other non-profit organizations. Millions of dollars have been raised through this unique appreciation of the history and beauty of vintage automobiles. There are thousands of collector car shows and car clubs across the country and a great number of them contribute to worthy causes. 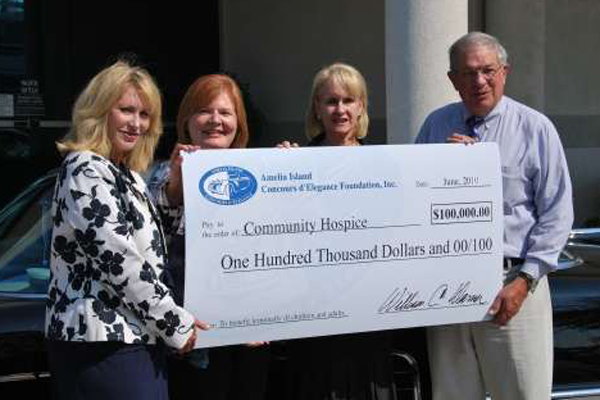 Amelia Island Concours presents check to Community Hospice. What sets the concours d’elegance type of show apart from the others are the galas, parties, sponsor events, automotive art shows, auctions, and car tours that take place over several days leading up to the main event, which most of the time is on a Sunday. Hundreds of car enthusiasts and civic-minded individuals volunteer their time and expertise to ensure the success of a show. The end result is a hopefully large check — both in dollars and physical size.